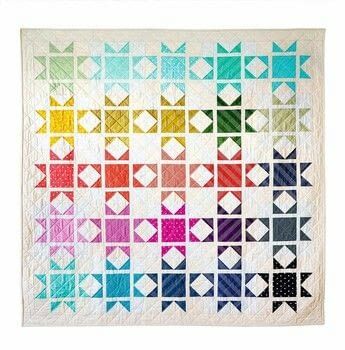 This quilt takes the popular morning star block and opens it out into a bigger block by using sashing in between the block units. 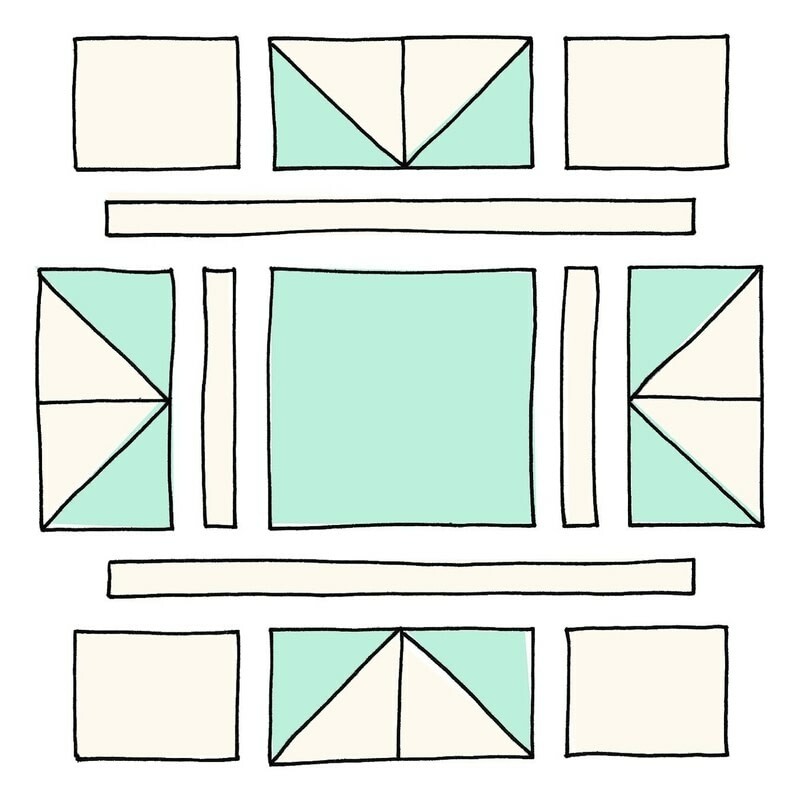 You can speed up the process by using half-square triangle units, paper pieced in batches for a quicker finish. I used two slightly different background colors (parchment and cream) to create a subtle checkerboard pattern in the quilt. There are so many fantastic solid and semi-solid fabrics currently available that would be perfect for this design. © 2019 Lynne Goldsworthy / Taunton · Reproduced with permission. 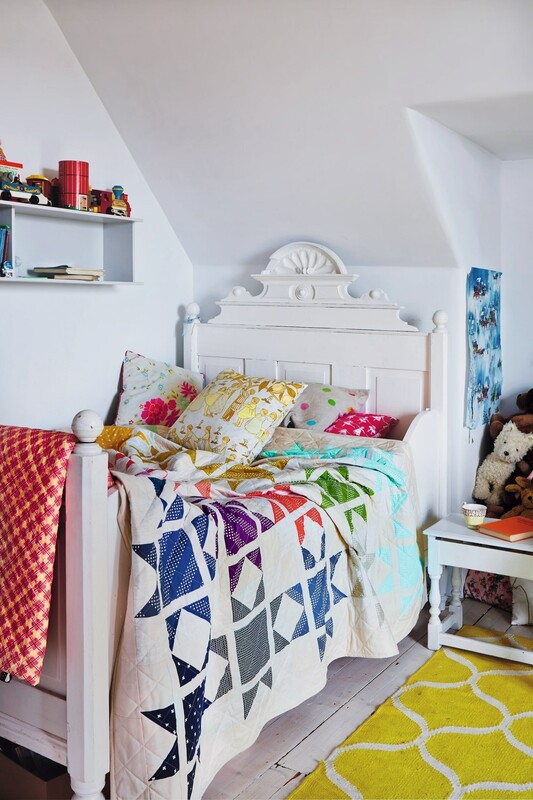 · Quick & Easy Quilts published by The Taunton Press 2017 by Lynne Goldsworthy, and photographer by Jan Baldwin. 6 Before starting to make the blocks, decide on the layout of the twenty-five fabrics. Thirteen of the print fabrics will be paired with the A background fabric and twelve will be paired with B background fabric. The A and B background fabrics form a subtle checkerboard pattern. 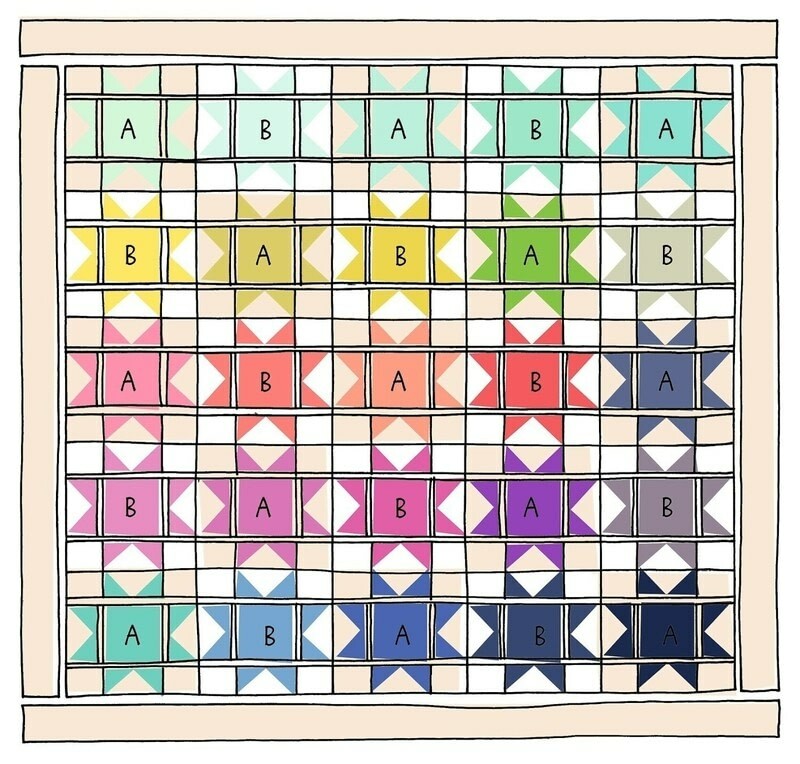 The quilt assembly is shown in Fig 2, so refer to that for guidance (background fabric A is used in the four blocks in each corner of the quilt and the outer border). 7 Start by making the HST units, as follows: Pin one background 8½in square and one print 8½in square to the back of each of the twenty-five paper templates, with the fabrics right sides together and the background fabric next to the paper. Shorten your machine stitch length to 14 to 18 stitches per inch and sew along all of the blue lines. 8 Cut the template and fabric along all the green lines using a rotary cutter. Trim off the corners on each triangle along the red lines. 9 Press each HST unit open. Remove the paper from the back of each unit. Each unit should be 3½in square. 10 Assemble each block as follows (see Fig 1). 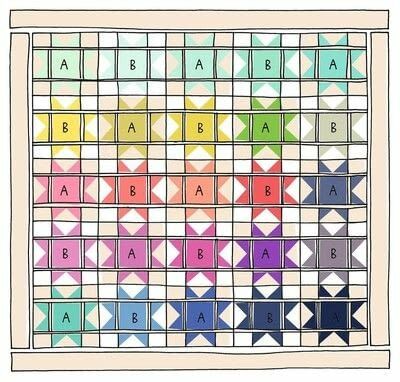 Take care to use the correct A or B background fabric pieces when adding strips and rectangles to HST units. Start by sewing the HSTs into four pairs, with the background fabric together. 11 Sew 3½in x 4½in rectangles to each end of two of those units. 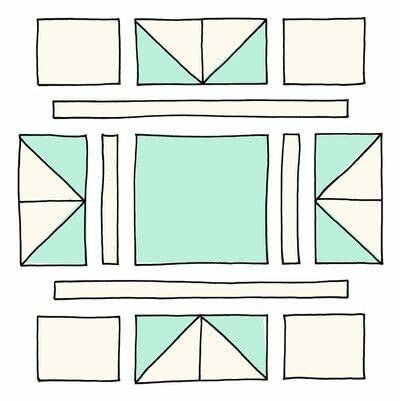 Sew 1½in x 6½in strips of background fabric to each side of the central 6½in square. 12 Sew the two remaining HST units to either side of this central unit. 13 Sew the five rows of the block together using 1½in x 14½in strips of background fabric between the top and the center row and between the bottom and the center row. 14 Repeat this process to make the remaining twenty-four blocks. 1 Cut each of the twenty-five F8ths into one 6½in square for the block center and one 8½in square for the star points HST. • Three 8½in x WOF strips. Sub-cut into thirteen 8½in squares (five per strip). • Thirteen 1½in x WOF strips. Sub-cut each strip into two 1½in x 6½in strips and two 1½in x 14½in strips, to yield twenty-six of each in total. • Thirteen 3½in x WOF strips. Sub-cut six of those into fifty-two 3½in x 4½in rectangles (nine per strip). Sew the remaining seven strips end to end with straight seams and cut into two 70½in lengths and two 76½in lengths for the borders. • Three 8½in x WOF strips. Sub-cut into twelve 8½in squares (five per strip). • Twelve 1½in x WOF strips. Sub-cut each of those into two 1½in x 6½in and two 1½in x 14½in strips, to yield twenty-four of each in total. • Six 3½in x WOF strips. Sub-cut into forty-eight 3½in x 4½in rectangles (nine per strip). 4 Cut the backing fabric into two equal lengths. 5 Cut the binding fabric into eight 2½in x WOF strips. 15 Arrange your twenty-five blocks into five rows each with five blocks (see Fig 2). Sew the blocks together into rows, pressing the seams in opposite directions in each row. Sew the five rows together, matching seams carefully. 16 Pin and sew the 3½in x 70½in borders to the sides of the quilt. Press seams outwards. Add the 3½in x 76½in strips to the top and bottom of the quilt and press seams outwards. 17 Sew the two pieces of backing fabric together along the long sides using a ½in seam and press the seam open. Make a quilt sandwich of the quilt back (right side down), the batting and the quilt top (right side up). 18 Quilt as desired. 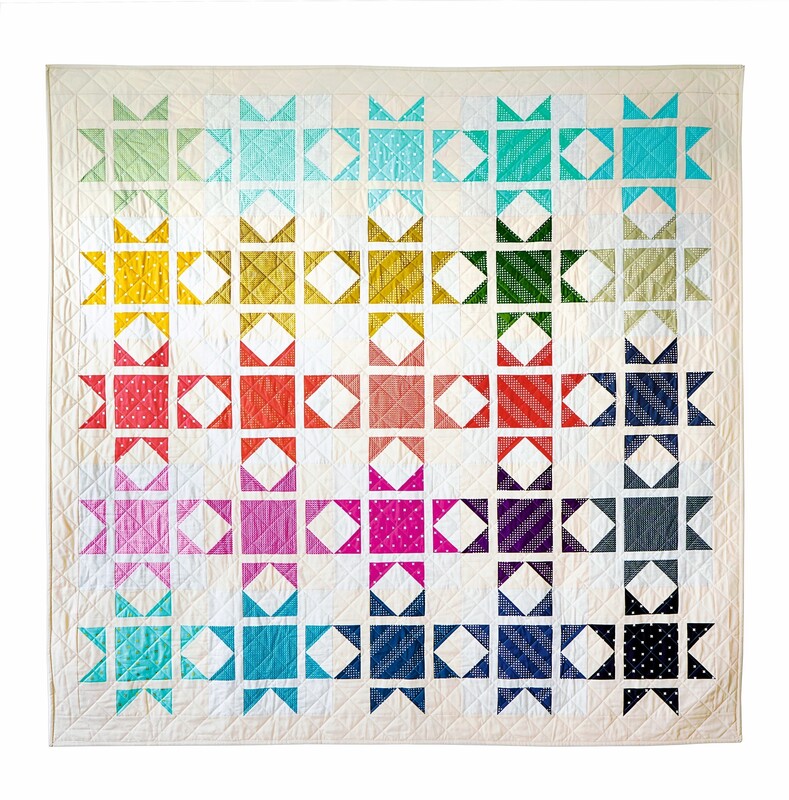 The quilt shown has a diagonal cross-hatch pattern of lines about 2in apart, using cream thread. 19 When all the quilting is finished, square up the quilt, trimming the batting and backing. 20 Sew the binding strips together end to end using diagonal seams or straight seams, as preferred. Press wrong sides together all along the length to make a double-fold binding. Bind the quilt to finish, taking care to miter the corners neatly.